I’ve always been a fan of football movies. Which is strange considering I don’t particularly care much for the sport itself. Watching it live, I find it slow, boring and I only vaguely understand the rules enough to get by. However, if told right and paced correctly in a story, there’s a special sort of high drama that goes hand in hand with the sport. Michael Koryta uses an infinitely talented and well disciplined high school football team chasing the state championship as a backdrop for a story about murder in a small town. The Austin brothers, Kent and Adam, lost their sister Marie amidst their glory days as gridiron gladiators for Chambers High. Fast forward to the present as a murder occurs that echos the death of Marie Austin all those years ago. Kent is the head coach of Chambers High when he’s informed of Rachel Bond’s death, his all-star wide receiver’s girlfriend. Kent hasn’t spoken to Adam in years but is brought into the case when it turns out Rachel visited Adam requesting he help her locate her estranged father. Working as a bail bondsman, Adam has never fully been able to move on following his sister’s death as he’s always blamed himself for indirectly causing it. When Rachel is murdered at a location Adam believed she would find her father, Adam views finding and killing the man responsible as a way to atone for past sins. Michael Koryta hadn’t been on my radar until a review popped up on Goodreads that caught my eye. 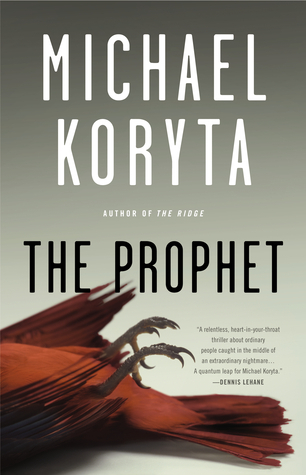 Now after reading The Prophet, I suddenly want to go out and grab everything Koryta’s written. His characters in The Prophet feel real enough to be anyone from smalltown, USA. Their actions and reactions seem genuine and the natural drama that would certainly arise out of losing a family member plays out perfectly over the course of the story. The progression of the story was easy to follow but with enough twists and turns to keep you guessing. I thought this was a hell of a read and it will likely sit alongside The Last Child as my go-to recommendations for thrillers. September 28, 2015 in Fiction, Michael Koryta.